UNHCR, the UN Refugee Agency, and the municipality of Trikala today launched a programme to provide accommodation and services for 420 refugees in the central Greece town. The new places will be located in 70 apartments in the latest important expansion of UNHCRs Accommodation and Services programme, which is funded by the European Union Civil Protection and Humanitarian Aid and has helped some 30,000 people with suitable accommodation since January 2016. 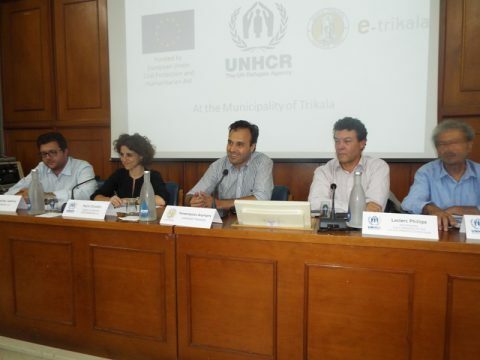 Under the agreement, signed in Trikala City Hall by UNHCR and e-Trikala S.E., the development company of Trikala Municipality, and in close cooperation with the Ministry of Migration Policy, particular consideration will be given to the needs of people hosted in the Trikala refugee accommodation site. Opening the event today, Dimitris Papastergiou, Mayor of Trikala, reminded the positive response towards refugees and hospitality offered so far by the Municipality and people of Trikala. He also thanked e-trikala for its cooperation and effectiveness in managing the programme. UNHCR’s Representative in Greece, Philippe Leclerc, noted this is a key moment for UNHCR signing the fifth partnership agreement with local authorities after Athens, Thessaloniki, Livadia and Crete. The scheme for the accommodation of asylum seekers in apartments in Trikala, which was signed on behalf of e-trikala by its president Giannis Kotoulas, will last until the end of 2017, while in the meantime e-trikala will also support the operation of the refugee accommodation site (former Atlantik) until its closure. The accommodation scheme includes provision of services such as psychosocial support, interpretation, transportation to and from the Asylum Service. Beneficiaries will be able to meet their basic daily needs through UNHCR’s cash card assistance program funded by the European Commission. E-Trikala, which has been actively engaged from the first moment in the support of refugees that arrived in the city, has already met high interest by apartment owners for the programme, which will be implemented with the support of local authorities, competent bodies and the civil society.